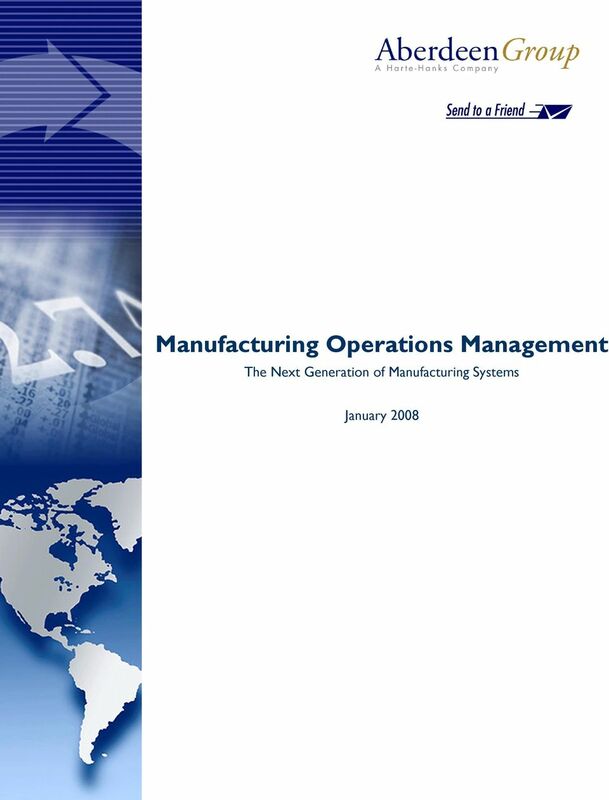 Download "Manufacturing Operations Management. The Next Generation of Manufacturing Systems"
3 Page 3 likely to use Quality Management Systems (QMS), 114% more likely to use Manufacturing Intelligence (MI), 55% more likely to use Advanced Planning and Scheduling (APS), and 56% more likely to use Lean manufacturing. 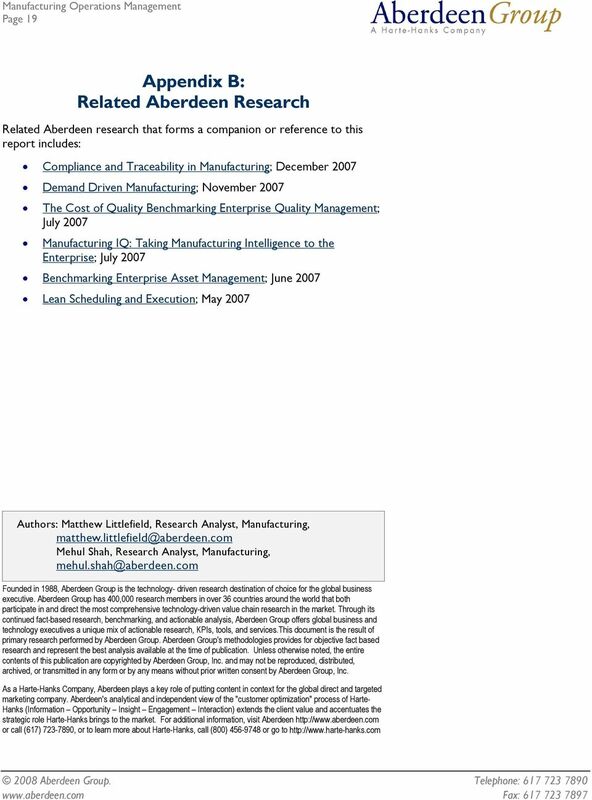 Required Actions The Scope of MOM has expanded beyond traditional MES, requiring the following actions for manufacturers to achieve Best-in-Class performance: Appoint an executive steering committee to define the strategy around manufacturing solutions investments, Best-in-Class manufacturers are 50% more likely than laggards to have done this. Furthermore, these executive steering committees give the responsibility of defining manufacturing solutions requirements to the manufacturing line of business leadership, while giving joint responsibility to both Manufacturing and IT for the deployment of manufacturing solutions. Plant floor automation and automated data collection are key capabilities that serve as the building blocks for expanding and investing in manufacturing operations. 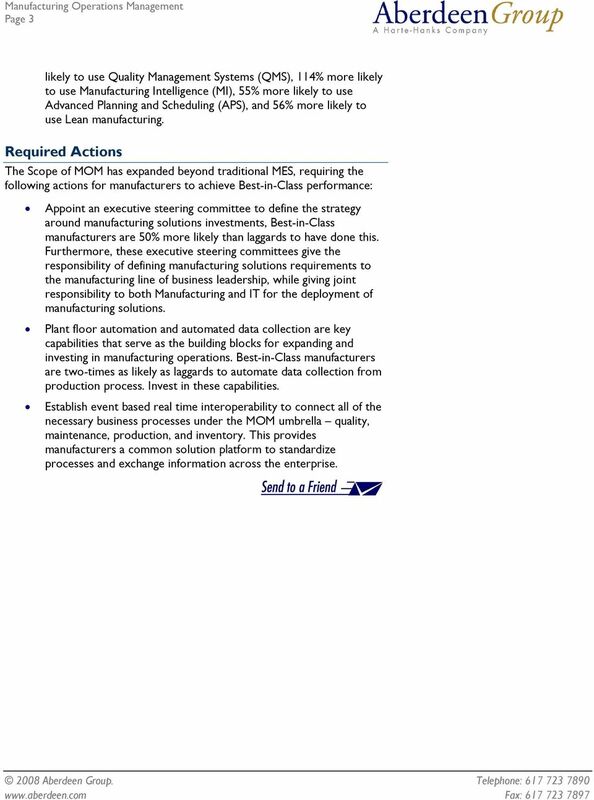 Best-in-Class manufacturers are two-times as likely as laggards to automate data collection from production process. Invest in these capabilities. Establish event based real time interoperability to connect all of the necessary business processes under the MOM umbrella quality, maintenance, production, and inventory. This provides manufacturers a common solution platform to standardize processes and exchange information across the enterprise. 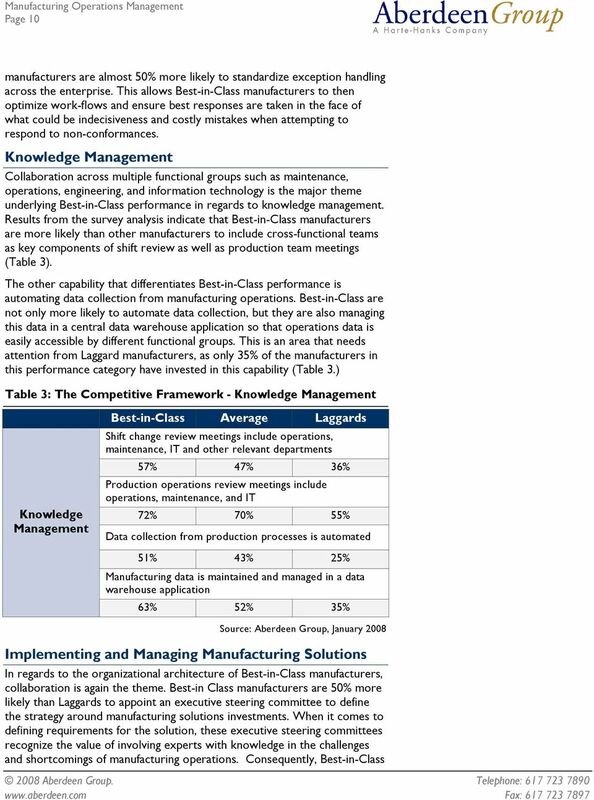 5 Page 5 Chapter One: Benchmarking the Best-in-Class Traditionally, manufacturing systems capabilities were built and configured to address specific departmental needs. This often resulted in an inefficient use of internal resources as well as an increased cost of ownership. Commonly termed "islands of automation," information had to be rationalized from disparate systems across organizational boundaries and company boundaries. In today's global manufacturing environment the challenges companies face are significantly different than what they did decades ago. 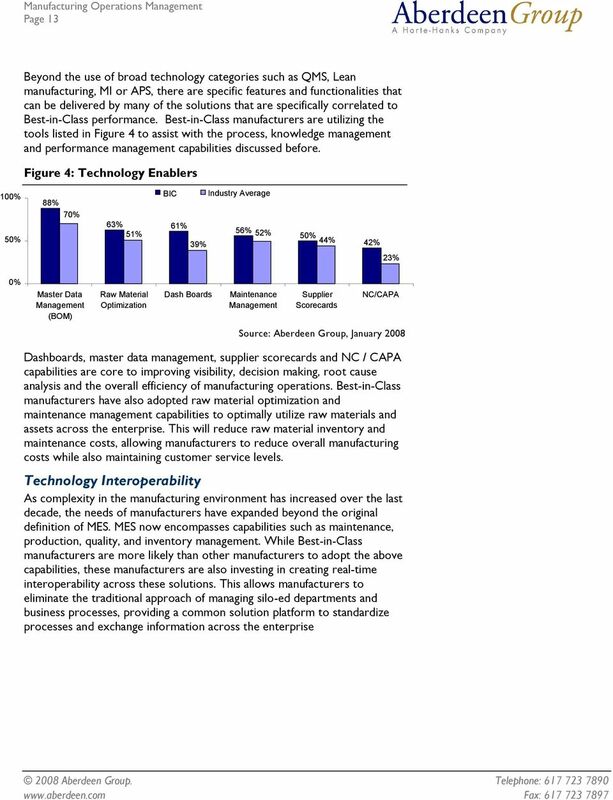 This benchmark report will focus on the capabilities companies are pursuing to bolster manufacturing efficiency by shifting focus from single site or single functional technologies to enterprise applications that offer capabilities allowing them to manage global operations in a dynamic market place. 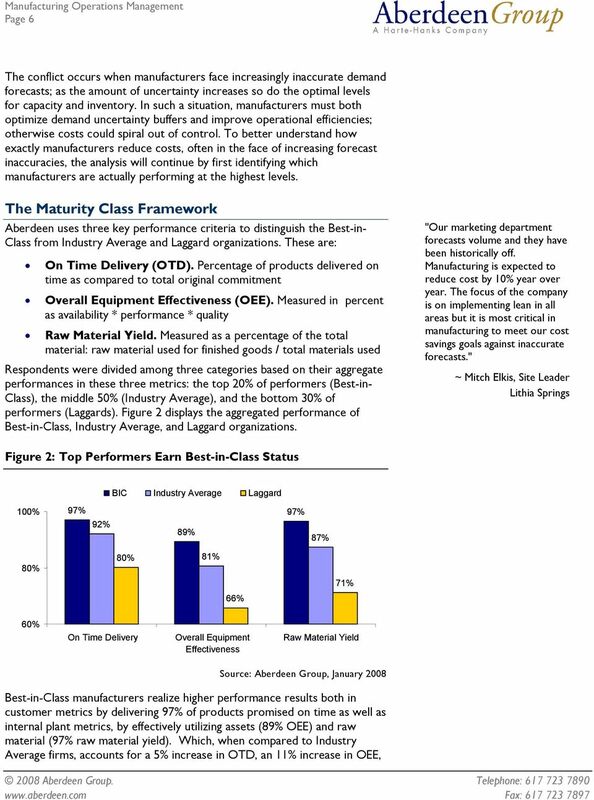 Fast Facts Best-in-Class enterprises significantly out perform their competition in all three KPIs. 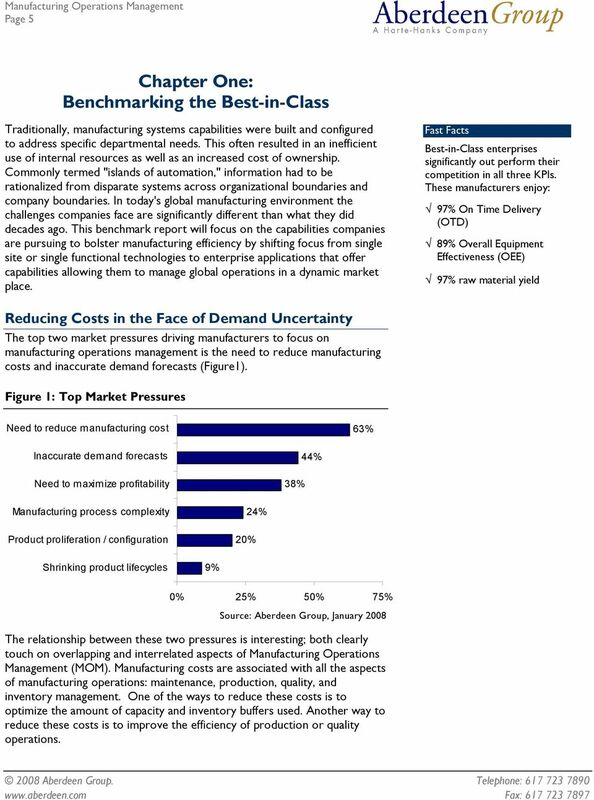 These manufacturers enjoy: 97% On Time Delivery (OTD) 89% Overall Equipment Effectiveness (OEE) 97% raw material yield Reducing Costs in the Face of Demand Uncertainty The top two market pressures driving manufacturers to focus on manufacturing operations management is the need to reduce manufacturing costs and inaccurate demand forecasts (Figure1). Figure 1: Top Market Pressures Need to reduce manufacturing cost 63% Inaccurate demand forecasts Need to maximize profitability 38% 44% Manufacturing process complexity Product proliferation / configuration 20% 24% Shrinking product lifecycles 9% 0% 25% 50% 75% The relationship between these two pressures is interesting; both clearly touch on overlapping and interrelated aspects of Manufacturing Operations Management (MOM). Manufacturing costs are associated with all the aspects of manufacturing operations: maintenance, production, quality, and inventory management. One of the ways to reduce these costs is to optimize the amount of capacity and inventory buffers used. Another way to reduce these costs is to improve the efficiency of production or quality operations. 7 Page 7 and an 11% increase in raw material utilization. 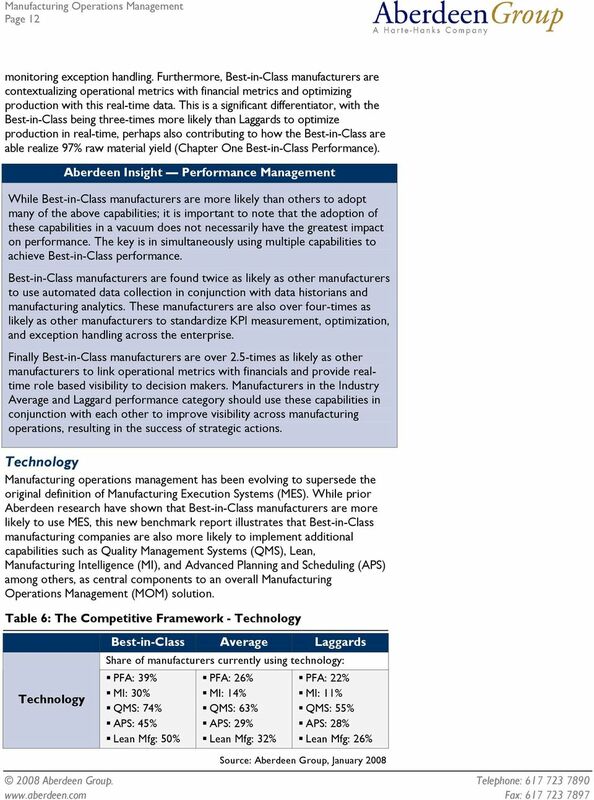 Clearly, the Best-in-Class are enjoying significantly lower manufacturing costs coupled with better customer service. The key to this benchmark study is in determining just how the Best-in-Class are achieving these results. 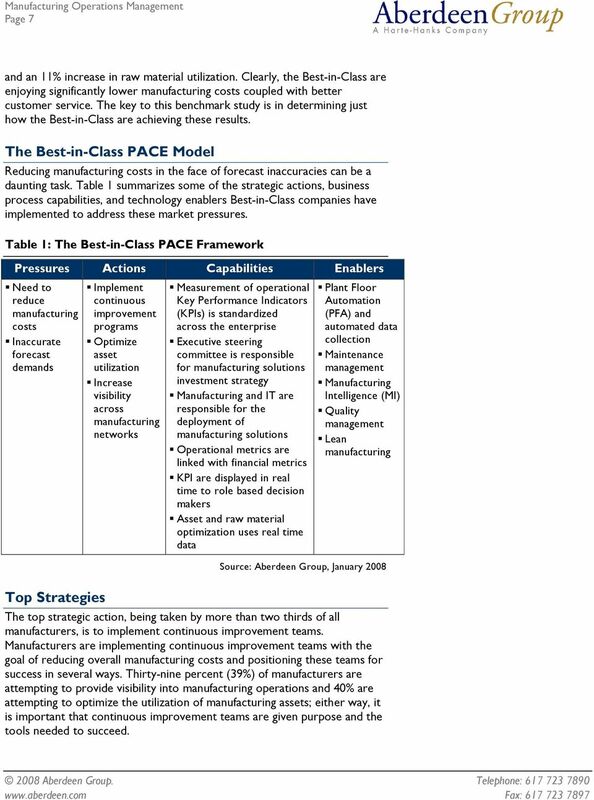 The Best-in-Class PACE Model Reducing manufacturing costs in the face of forecast inaccuracies can be a daunting task. 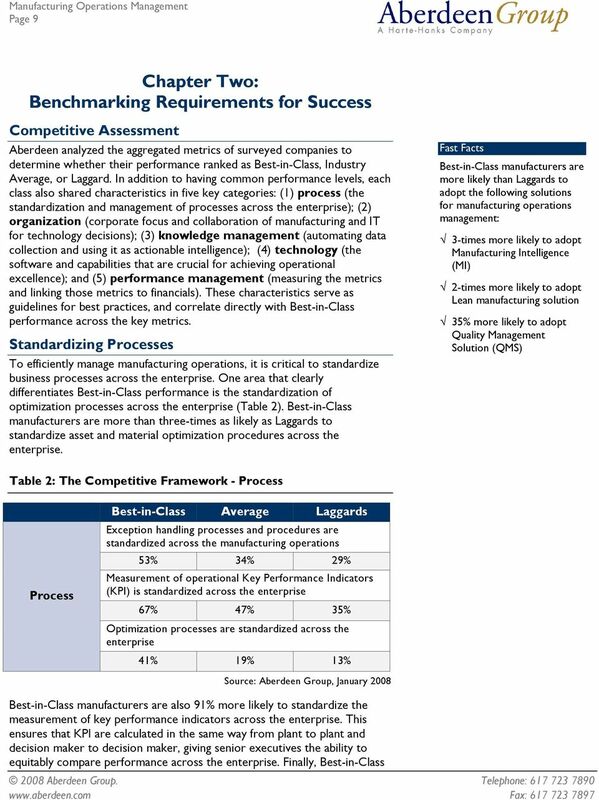 Table 1 summarizes some of the strategic actions, business process capabilities, and technology enablers Best-in-Class companies have implemented to address these market pressures. Table 1: The Best-in-Class PACE Framework Pressures Actions Capabilities Enablers Need to reduce manufacturing costs Inaccurate forecast demands Implement continuous improvement programs Optimize asset utilization Increase visibility across manufacturing networks Measurement of operational Key Performance Indicators (KPIs) is standardized across the enterprise Executive steering committee is responsible for manufacturing solutions investment strategy Manufacturing and IT are responsible for the deployment of manufacturing solutions Operational metrics are linked with financial metrics KPI are displayed in real time to role based decision makers Asset and raw material optimization uses real time data Plant Floor Automation (PFA) and automated data collection Maintenance management Manufacturing Intelligence (MI) Quality management Lean manufacturing Top Strategies The top strategic action, being taken by more than two thirds of all manufacturers, is to implement continuous improvement teams. Manufacturers are implementing continuous improvement teams with the goal of reducing overall manufacturing costs and positioning these teams for success in several ways. 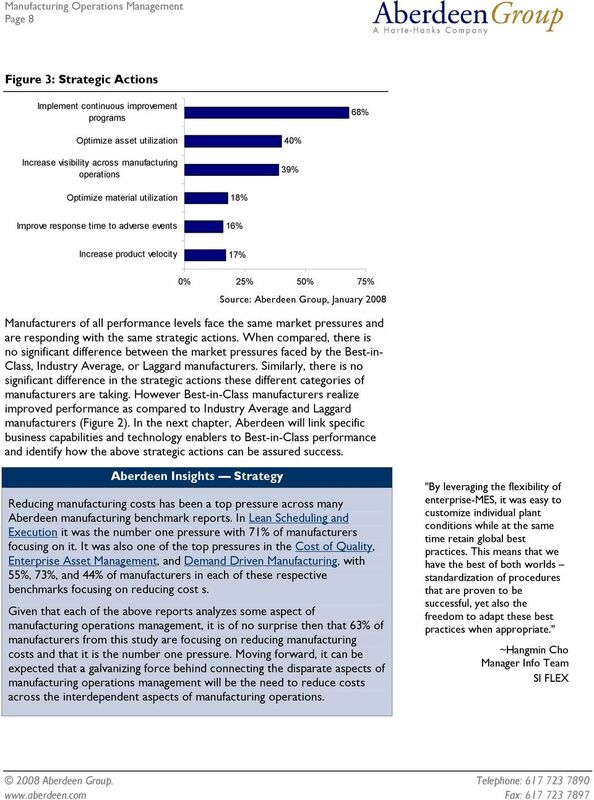 Thirty-nine percent (39%) of manufacturers are attempting to provide visibility into manufacturing operations and 40% are attempting to optimize the utilization of manufacturing assets; either way, it is important that continuous improvement teams are given purpose and the tools needed to succeed. 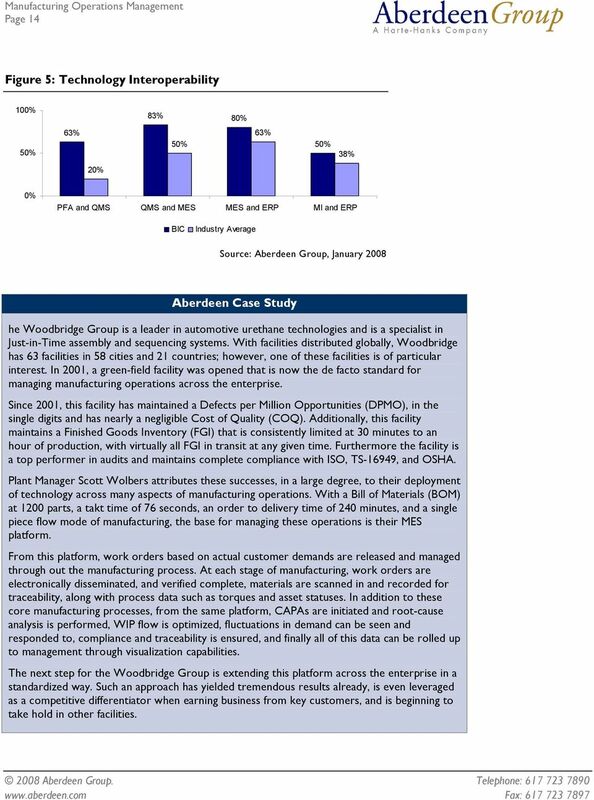 14 Page 14 Figure 5: Technology Interoperability 100% 83% 80% 50% 63% 50% 63% 50% 38% 20% 0% PFA and QMS QMS and MES MES and ERP MI and ERP BIC Industry Average Aberdeen Case Study he Woodbridge Group is a leader in automotive urethane technologies and is a specialist in Just-in-Time assembly and sequencing systems. With facilities distributed globally, Woodbridge has 63 facilities in 58 cities and 21 countries; however, one of these facilities is of particular interest. In 2001, a green-field facility was opened that is now the de facto standard for managing manufacturing operations across the enterprise. Since 2001, this facility has maintained a Defects per Million Opportunities (DPMO), in the single digits and has nearly a negligible Cost of Quality (COQ). Additionally, this facility maintains a Finished Goods Inventory (FGI) that is consistently limited at 30 minutes to an hour of production, with virtually all FGI in transit at any given time. Furthermore the facility is a top performer in audits and maintains complete compliance with ISO, TS-16949, and OSHA. Plant Manager Scott Wolbers attributes these successes, in a large degree, to their deployment of technology across many aspects of manufacturing operations. With a Bill of Materials (BOM) at 1200 parts, a takt time of 76 seconds, an order to delivery time of 240 minutes, and a single piece flow mode of manufacturing, the base for managing these operations is their MES platform. From this platform, work orders based on actual customer demands are released and managed through out the manufacturing process. At each stage of manufacturing, work orders are electronically disseminated, and verified complete, materials are scanned in and recorded for traceability, along with process data such as torques and asset statuses. In addition to these core manufacturing processes, from the same platform, CAPAs are initiated and root-cause analysis is performed, WIP flow is optimized, fluctuations in demand can be seen and responded to, compliance and traceability is ensured, and finally all of this data can be rolled up to management through visualization capabilities. The next step for the Woodbridge Group is extending this platform across the enterprise in a standardized way. Such an approach has yielded tremendous results already, is even leveraged as a competitive differentiator when earning business from key customers, and is beginning to take hold in other facilities. 16 Page 16 BIC and 14% Industry Average). Manufacturers that have not yet adopted this capability should do so to gain early competitive advantage. 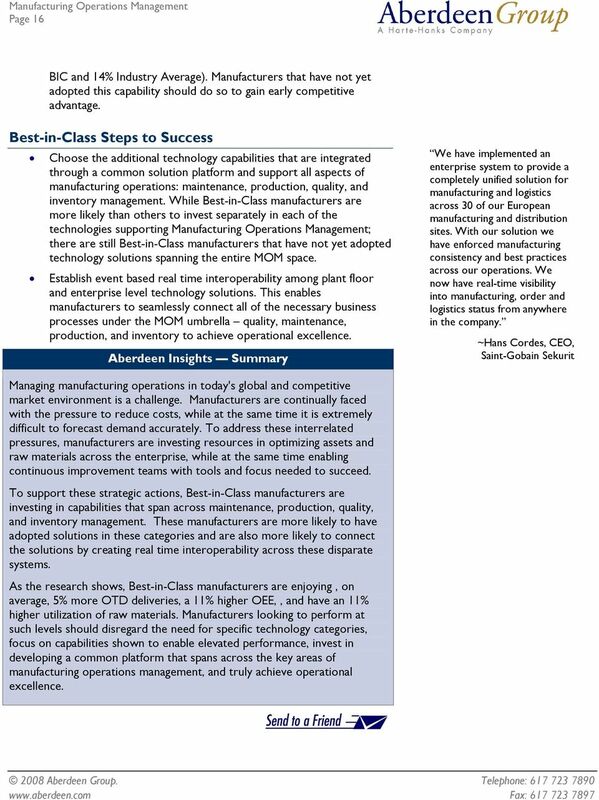 Best-in-Class Steps to Success Choose the additional technology capabilities that are integrated through a common solution platform and support all aspects of manufacturing operations: maintenance, production, quality, and inventory management. 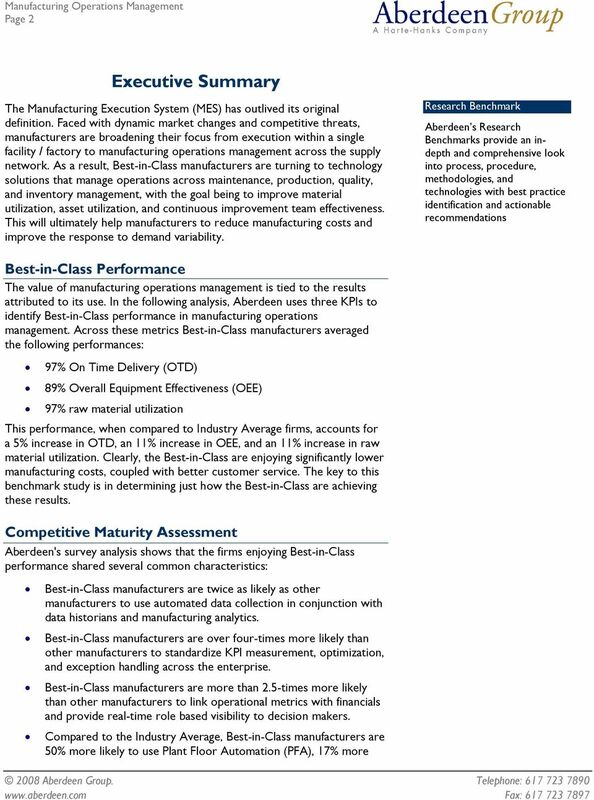 While Best-in-Class manufacturers are more likely than others to invest separately in each of the technologies supporting Manufacturing Operations Management; there are still Best-in-Class manufacturers that have not yet adopted technology solutions spanning the entire MOM space. Establish event based real time interoperability among plant floor and enterprise level technology solutions. This enables manufacturers to seamlessly connect all of the necessary business processes under the MOM umbrella quality, maintenance, production, and inventory to achieve operational excellence. Aberdeen Insights Summary We have implemented an enterprise system to provide a completely unified solution for manufacturing and logistics across 30 of our European manufacturing and distribution sites. With our solution we have enforced manufacturing consistency and best practices across our operations. We now have real-time visibility into manufacturing, order and logistics status from anywhere in the company. ~Hans Cordes, CEO, Saint-Gobain Sekurit Managing manufacturing operations in today's global and competitive market environment is a challenge. Manufacturers are continually faced with the pressure to reduce costs, while at the same time it is extremely difficult to forecast demand accurately. To address these interrelated pressures, manufacturers are investing resources in optimizing assets and raw materials across the enterprise, while at the same time enabling continuous improvement teams with tools and focus needed to succeed. 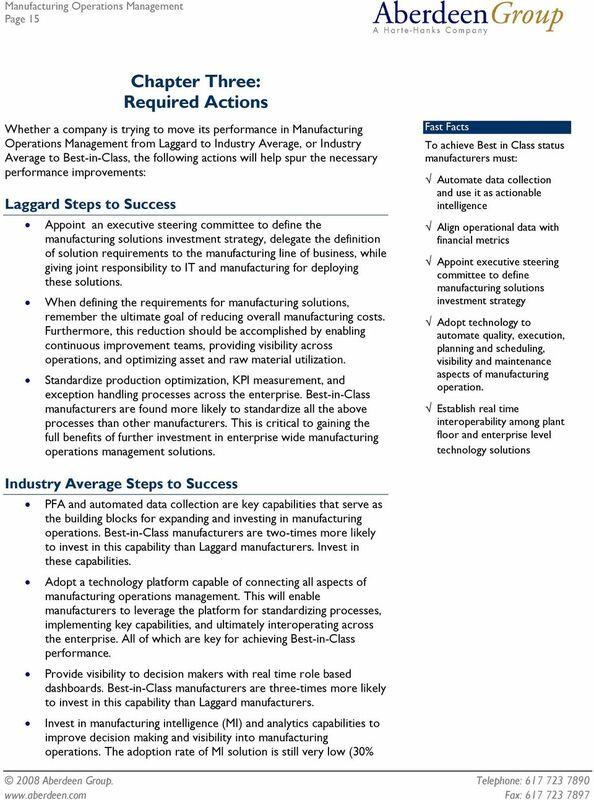 To support these strategic actions, Best-in-Class manufacturers are investing in capabilities that span across maintenance, production, quality, and inventory management. These manufacturers are more likely to have adopted solutions in these categories and are also more likely to connect the solutions by creating real time interoperability across these disparate systems. As the research shows, Best-in-Class manufacturers are enjoying, on average, 5% more OTD deliveries, a 11% higher OEE,, and have an 11% higher utilization of raw materials. 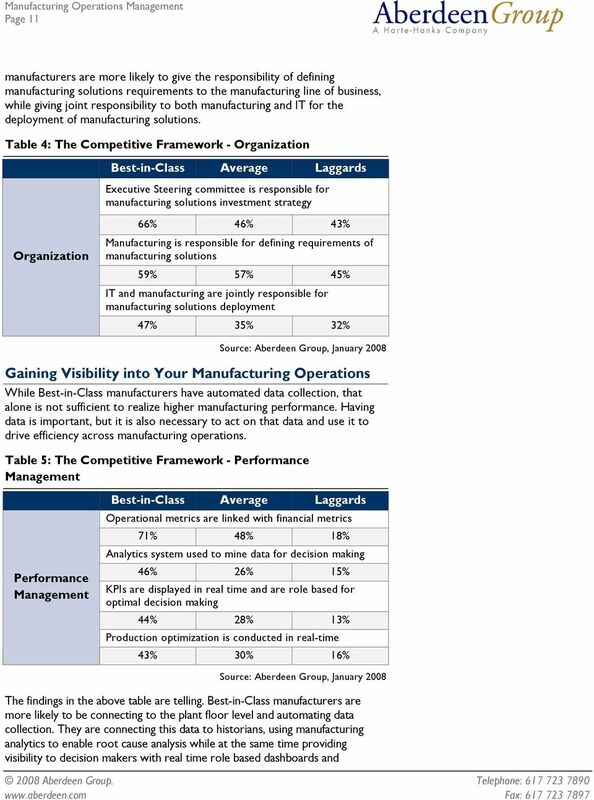 Manufacturers looking to perform at such levels should disregard the need for specific technology categories, focus on capabilities shown to enable elevated performance, invest in developing a common platform that spans across the key areas of manufacturing operations management, and truly achieve operational excellence. 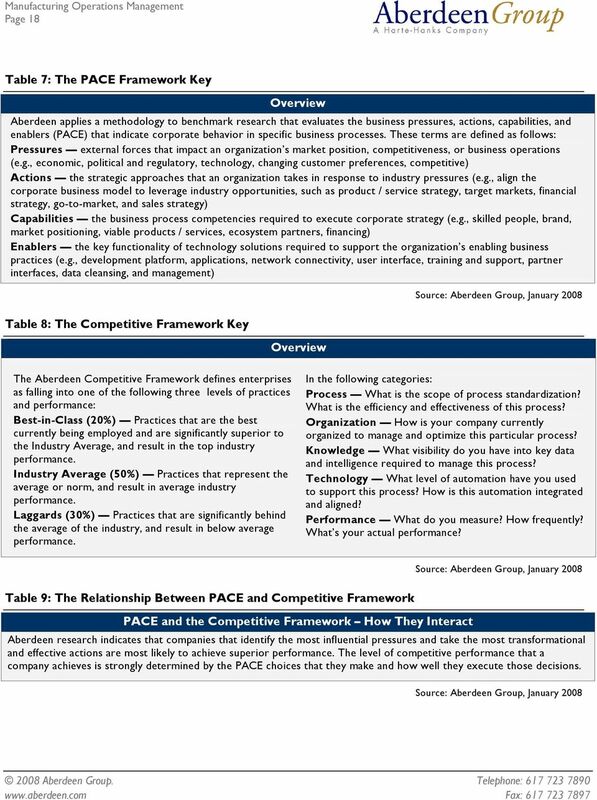 18 Page 18 Table 7: The PACE Framework Key Overview Aberdeen applies a methodology to benchmark research that evaluates the business pressures, actions, capabilities, and enablers (PACE) that indicate corporate behavior in specific business processes. These terms are defined as follows: Pressures external forces that impact an organization s market position, competitiveness, or business operations (e.g., economic, political and regulatory, technology, changing customer preferences, competitive) Actions the strategic approaches that an organization takes in response to industry pressures (e.g., align the corporate business model to leverage industry opportunities, such as product / service strategy, target markets, financial strategy, go-to-market, and sales strategy) Capabilities the business process competencies required to execute corporate strategy (e.g., skilled people, brand, market positioning, viable products / services, ecosystem partners, financing) Enablers the key functionality of technology solutions required to support the organization s enabling business practices (e.g., development platform, applications, network connectivity, user interface, training and support, partner interfaces, data cleansing, and management) Table 8: The Competitive Framework Key Overview The Aberdeen Competitive Framework defines enterprises as falling into one of the following three levels of practices and performance: Best-in-Class (20%) Practices that are the best currently being employed and are significantly superior to the Industry Average, and result in the top industry performance. Industry Average (50%) Practices that represent the average or norm, and result in average industry performance. Laggards (30%) Practices that are significantly behind the average of the industry, and result in below average performance. In the following categories: Process What is the scope of process standardization? What is the efficiency and effectiveness of this process? Organization How is your company currently organized to manage and optimize this particular process? Knowledge What visibility do you have into key data and intelligence required to manage this process? Technology What level of automation have you used to support this process? How is this automation integrated and aligned? Performance What do you measure? How frequently? What s your actual performance? Table 9: The Relationship Between PACE and Competitive Framework PACE and the Competitive Framework How They Interact Aberdeen research indicates that companies that identify the most influential pressures and take the most transformational and effective actions are most likely to achieve superior performance. The level of competitive performance that a company achieves is strongly determined by the PACE choices that they make and how well they execute those decisions.